Modern Phoenix specializes in the primary source documentation of midcentury modern design in Phoenix. We also cover contemporary architecture and rehabilitations of old structures of the Modern era. We often acquire reprints of articles written and published elsewhere (sometimes long ago) with the author's consent. This page features our articles with substantial interviews and commentary by text, or in-depth photo essays. If you can't find what you're looking for here, try the Google Search on the right, or browse our Architects and Neighborhoods pages for less text-heavy material, deeper links and external resources. An update on Beadle's White Gates: how those beguiling elliptoid screens were made! The Breech House by Ard Hoyt in Clearwater Hills gets a complete refresh for 2014. You can see it today, or compare then and now. We take a trip up to see Richard Neutra's Painted Desert Visitor Center in Northern Arizona. Remembering Frank Henry 1934 - 2013. Includes biography and memorial information. Ard Hoyt's House of Light in Marion Estates was intended to exploit "All Electric Living" when electricity was cheap and abundant in his Gold Medallion Homes. The Marion Estates neighborhood is an enclave of custom, semi-custom and tract homes near the head of Camelback Mountain at 44th Street and Stanford Drive. Features homes by Blaine Drake, Ralph Haver, Al Beadle, and more. When good intentions fall short of expectations: the new paint job at the Bank of America makes 20th and Camelback even more of a heartbreak. The fiercely independent neighborhood of Sunnyslope celebrates its 100th year. Discover the history and architecture of this charming hillside area. Superlite Concrete Masonry Units helped shape Phoenix into the concrete block capital of the world. The architecture that happened along the way is distinctly Phoenician, and modern by virtue of its cost and form. The Shaffer residence by Ard Hoyt in Clearwater Hills was another home in danger of being scraped for something better. The Postwar Architecture Task Force of Greater Phoenix's Top 25 midicentury buildings on KJZZ. Architect DK Taylor settled down in Scottsdale and built a beautiful home in Paradise Valley. He even designed the Sandra Day O'Connor house, a work so distinctive it was disassembled brick by brick and rebuilt in Papago Park! Beef Eaters Restaurant has been vacant for years. See what it looked like before Changing Hands and Southern Rail saved it. There's a reason why exterior lighting looks so funky in Phoenix. Meet James Salter AIA, lighting design virtuoso of the 60s. Watch as the façade to Beadle's 341 building on Camelback gets scraped for something "better". A trip to the Getty Research Institute unearthed hundreds of photographs of Arizona architecture by reknowned photographer Julius Shulman, and we brought over 70 of them back. In loving memory, we present this tribute featuring his Arizona work rarely found in printed anthologies today. Fred Guirey, FAIA, designed some of the most unique homes in the Phoenix area, and much of the roadside architecture we drive by every day. Includes original photos from the 1940s, a roster of his built projects and an interactive map of his architecture in the Valley. Charles and Arthur Schreiber: Modern for the Market Walt Lockley's research into the work of the Schreiber brothers, architects of familiar tract homes of Village Grove, HIdden Village and Vilage Meadows. Includes printable souvenir PDF. Al Beadle's Executive Towers. in 1962 Alfred Newman Beadle designed the tallest highrise residental structure ever in uptown Phoenix. The Ralph Haver Archive NOTE: Your favorite pages may have been moved and now reside in the archive. Do you have a Haver Home? Use our Ralph Haver Taxonomy to find out. Growing Up Haver has all new and charming vintage photography to update our classic oral history by Bucky Haver. A time capsule in Janet Manor shows original finishes useful for future Ralph Haver restorations. Jazz Standard, Track 2: Original Photos of The Lorna House. View Shawn Kaffer's Haver home before it was transformed into a modern gem. Ralph Haver's Hopkins House updated in 2008 View Modern Phoenix website founders Matthew and Alison King's 1946 Haver Home about 2.5 years into rehabbing. 50 fun photos by fans on our 2012 home tour in Marion Estates. Jacob Lichner's photos of our 2012 tour homes. 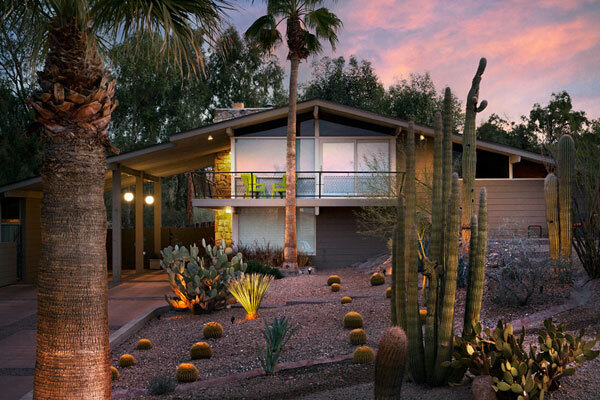 Docomomo US Tour Day 2015 featured five midcentury modern properties across Central Phoenix. Jane's Walk 2010 featured early industrial midcentury architecture by familiar names like Weaver & Drover and Ed Varney. Photos from the Ernest A. and Billie W. Uhlmann Family Archive illustrate the glory days of the swingin' Safari Hotel in Scottsdale. Chef Joe LaVilla's collection of vintage menus from Valley restaurants showcases impressive and whimsical design. They just don't make menus like they used to, do they? Nor can you get Prime Rib for three bucks anymore. Not only do we have menus, we have restaurant ads, too. Check out the charming signage, renderings and gimmicks used to draw midcentury diners in. Our obsession with vintage graphic design goes even further with our favorite local vintage illustrations. A Survey of Multifamily Condos and Apartments in Central and Uptown Phoenix, featuring great design by familiar architects. Produced using resources compiled by the Historic Preservation Office of the City of Phoenix. The Summer of Sandblasting. Three MoPhos relate their experience and advice on sandblasting block. Vintage brochure of The Valley National Bank by Weaver and Drover at Indian School and Central Avenue. 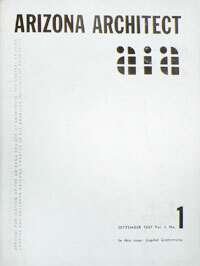 Fifteen full reprints of the AIA's vintage magazine Arizona Architect from 1957 to 1959 in PDF format. Watch the Founding Fathers of Modern Phoenix debate, develop theories, party and gain national recognition for their architectural accomplishments. Reproduced with kind permission of the Arizona AIA. 1960s coverage of the award-winning Phoenix Municipal complex by Ralph Haver in downtown Phoenix by Arizona Architect magazine by the AZ AIA. A Student's-eye view of their brand new high school, Ralph Haver's Coronado High. From the 1967 Cononado High yearbook themed "Our Town". The Steel and Glass Man by Gene Garrison, an Al Beadle interview from the 80s. A collaboration between Tonnesen, Inc. and the Kings creates a modern steel fence around their vintage Haver Home. How to remove your midcentury grass lawn by Scott McMahon. Is Paradise Gardens a genuine Beadle design, or just suffering from Beadle Mania? The wikipedia entry on Ralph Haver, co-written by Modern Phoenix members. Is the Kon Tiki hotel doomed for demolition?